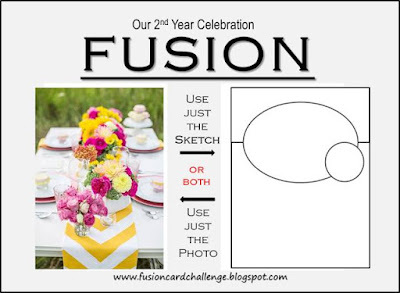 Excited to share with you today that I am celebrating over at the Fusion Card Challenge for their 2nd Year Celebration! 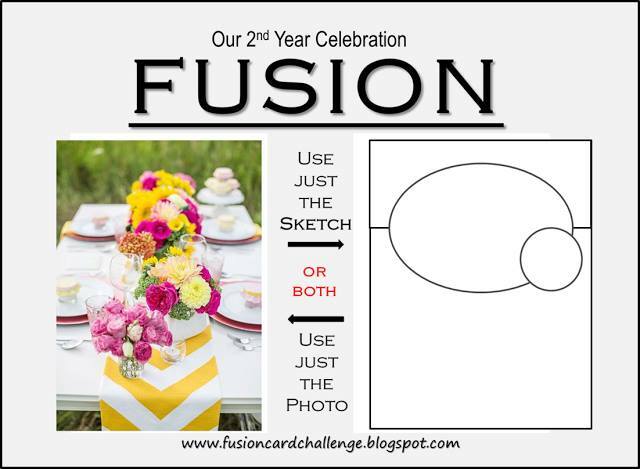 I was thrilled when Fusion Design Team Member Katie Brooks asked me to be her guest for the fun. I played along with both the challenge photo and the sketch. I started by adhering a piece of pink chevron paper to the top of the card base. Then I stamped the sentiment on a zig zag stitched oval die cut which I adhered with foam tape. The butterfly die cut was watercoloured with Gansai watercolours and finally I finished it off with a few clear sequins. Head over to Fusion to see what the amazing DT has made for the challenge and to see all of the other guests! Clean, bright, cheerful - wonderful, Tracey!! Oh la la...I love all the clean, crisp white space...you knocked the inspiration and the sketch out of the park! So beautiful, Tracey! Love the pink and yellow together! This is SO very pretty Tracey!! I love the pink chevron with the yellow butterfly, just lovely!! 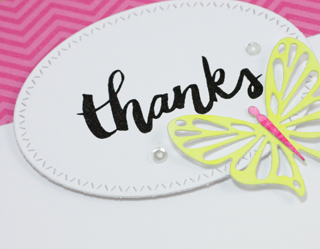 yay for guesting.. this card is perfect..i love that little butterfly..
Wow! That butterfly is beautiful surrounded by all that glossy shine from the clear seqins! Love, love this CAS bright card! It helps brighten a gloomy day! CAS Perfection!! Beautiful design and elements ... especially love that gorgeous butterfly. Congrats on being GD for Fusion's 2nd birthday! This is so lovely, the butterfly, the gorgeous font of the sentiment, the pink chevron, perfection!!! So CAS and pretty. You are the best at Clean and Simple. This is beautiful! So crisp and clean and bright! Gorgeous card, Tracey! I love the patterned paper at the top of the card and that beautiful butterfly die cut. Thanks so much for having me as a guest at Fusion! Congrats on your GD spot. This is a fantastic card. I especially love your butterfly and that wild pink chevron. What a perfect way to interpret both parts of this challenge! Gorgeous card, Tracey. Congrats on the GDT! Congrats on guesting Tracey your card is charming!! I like the tiny pink body on the butterfly!! Congrats, Tracey! Your card is so lovely--perfectly crafted! You totally rocked this challenge! So lucky to have such a sweet, amazing woman as my guest! Thank you so much! Congrats on your guest spot! Love your charming card--so sweet in pink and yellow! wow,this is gorgeous! Beautiful colors, gorgeous layout! Yay you...this card is perfect! Congrats on your guest designer spot. What a wounderful card you've created for the challenge! This is beautiful Tracey and you did both! Im sure you had lots of invites for this one! Congrats! Congrats on your guest design spot...this is one gorgeous card! Love that sweet butterfly. Congrats on your Guest Designer spot, Tracey! Such a beautiful card, and a fabulous take on the photo and sketch...Love it! CAS and FABulous Tracey! So glad you joined in the fun as a super special guest to celebrate FUSION 2nd Anniversary! Love, love, LOVE the pink and yellow here! You're totally rocking the springtime goodness over here, girl! I can't keep up!